Old world styling straight from the hometown of Elvis! (3BL Media) March 14, 2012 – Don’t ever underestimate the South – not when it comes to artists, musical or otherwise. The South it seems never runs dry of creative talent. That is certainly true of Amy Howard, the Memphis-based designer of this lovely “Acanthus Bed,” one of the best selling items in the Amy Howard Collection and the Greenspiration Home American Made Pick-of-the-Week. 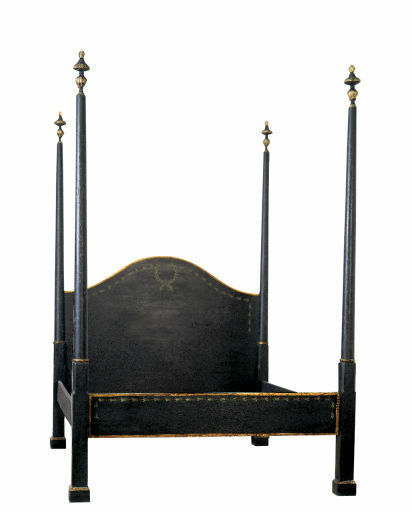 We think the bed looks outstanding in this antique black “Toscana” finish with gold accents, which, like all of Amy Howard’s Toscana paint finishes, is of “food grade quality.” Don’t eat it though – sleep in it, and when you're not doing that, show it off to your friends. All you need is 4-6 weeks lead-time and this exquisite bed could be making a 17th century Renaissance statement in your home. Amy Howard and her husband, Gene, got their start in the home furnishings business by restoring antique furniture. Over time, they developed a reputation for their fabulous finishes. Their favorite 17th and 18th century antiques, however, were becoming scarce so they started building their own versions of this timeless style, adopting the motto, “If we can’t find it, then we’ll make it!” It was a recipe for success, since the Amy Howard Collection has grown into one of the most sought-after furniture lines in the country. Looking at this bed, we understand why. Amy Howard has always been committed to creating beautiful furniture in the USA. The wood for the collection, which is entirely made by artisans at the company’s studio in Memphis, TN, is all sourced locally, whether it is reclaimed or native. Their signature Toscana finish is VOC-free and must be refrigerated as there are no preservatives in it. But don’t worry, room temperature is fine for any painstakingly sanded, painted, gilded, waxed and buffed piece of furniture in their entire line. “We are very proud to be an American furniture manufacturer, especially when many companies have been forced to move their manufacturing operations overseas due to economic factors,” said Amy. After perusing her collection, we think she’s got more reasons than that to be proud. You can find Amy Howard Collection thru interior designers or you to find more information or locate your closest showroom at www.amyhowardcollection.com. Greenspiration Home LLC is an online resource dedicated to helping homeowners build, renovate, and decorate green. The Greenspiration Home American Made “Pick-of-the-Week” campaign is part of the publication’s initiative to educate consumers about domestically made home décor options.